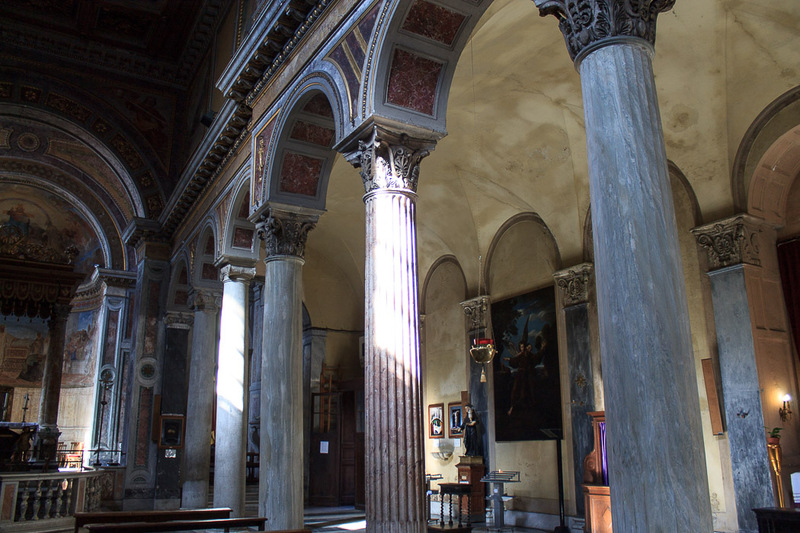 The church of San Nicola in Carcere (St. Nicolas in the Prison) was built on top of the foundations of, and includes some of the columns of, three republican-era temples which resembled the nearby Temple of Portunus. The underground can be visited for only €2. 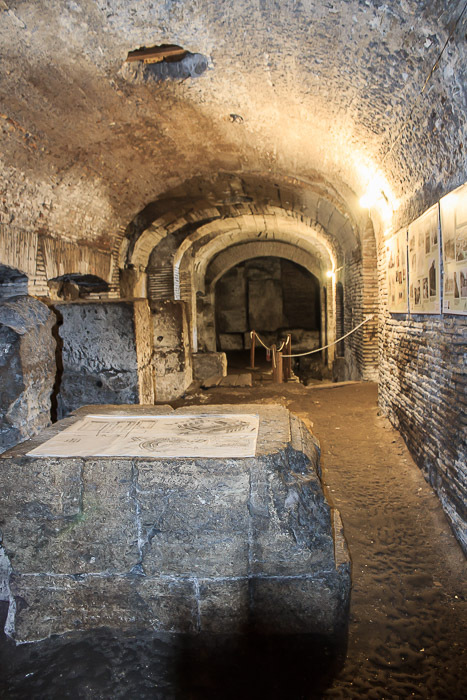 A free English info sheet is available, and English signs in the underground give you a pretty good idea of what you're seeing, making this one of the better underground sites in Rome. 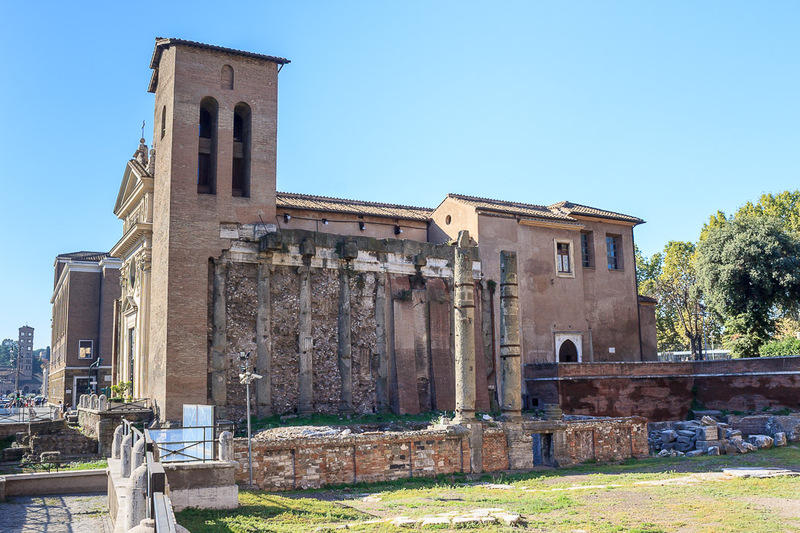 The church is (and the three temples were) located at the edge of the ancient Forum Holitorium, which was a fruit and vegetable market. The large buildings to the left of the church, across the street (as you look at the front of it) were at the heart of this market. Ships on the Tiber River (behind these buildings) delivered the fruits and vegetables to Rome. On the far side of the Forum Holitorium was the Forum Boarium (Cattle Market) which we'll reach very soon if you're following the To the Forum Boarium and Beyond Walking Tour. 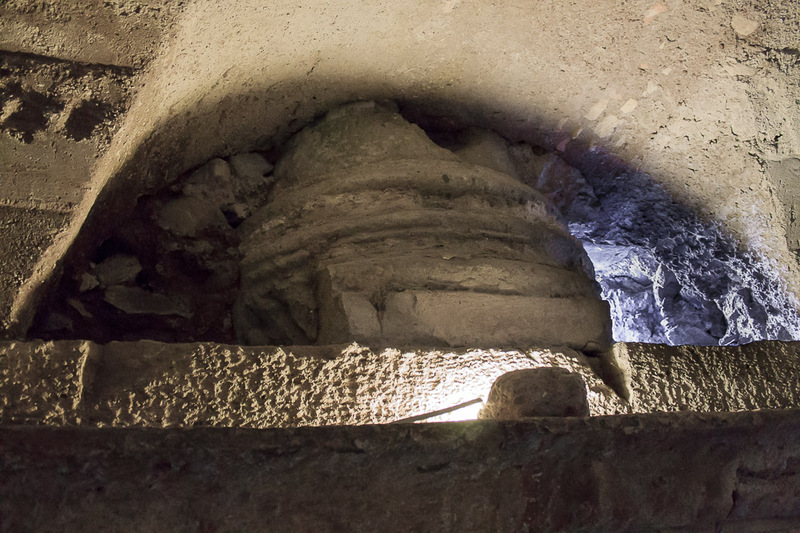 The church was built over three small temples (1st photo below) which stood very close to each other, all facing eastwards and aligned from north to south, similar to those seen in Largo di Torre Argentina. The central and largest temple was the Temple of Juno Sospita (the savior), vowed by consul Cornelius Cethegus between 197 BC and 194 BC during the war against the Insubrians in northern Italy, and the church of San Nicola in Carcere covers that middle temple completely as well as incorporating the columns on the near side of both the northern and southern temples into its outer walls. The old-looking column built into the front facade (2nd photo below) of the church near the left edge is from the second row of columns of the middle temple. So are the columns on either side of the door, but those were re-faced in stucco, so the ancient columns, although technically there, are hidden from view. 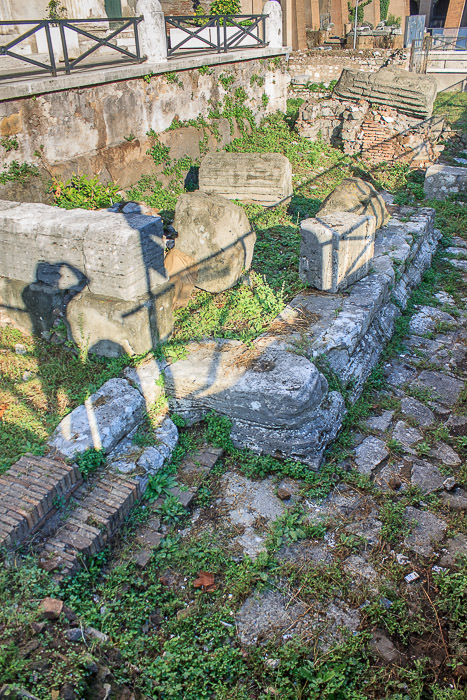 The meager remains of the steps to that temple are preserved in front of the church (3rd and 4th photos below). And hey, there's the shadow of a Tourist in Rome, taking a photo, in the 3rd photo below! 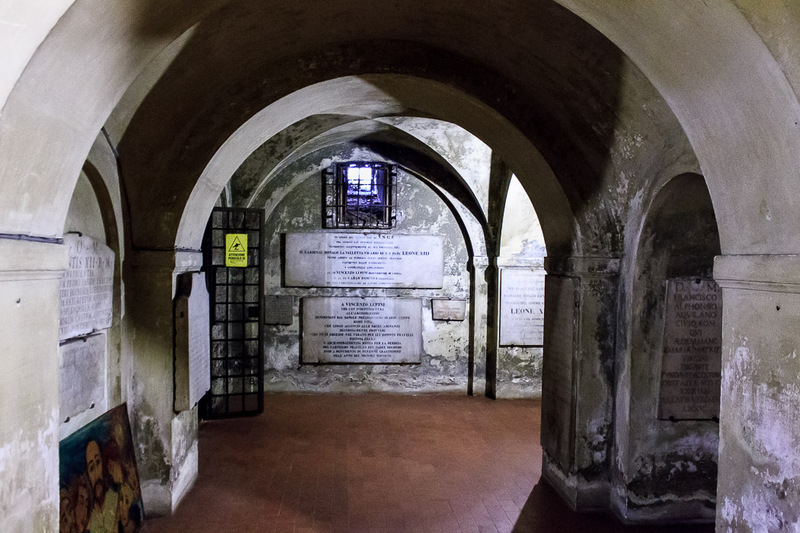 See all San Nicola in Carcere photos. The southern temple (the left temple, when viewed from the front) was the Temple of Spes (Hope, or Fortune), built in 250 BC during the First Punic War against the Carthaginians by Attilius Calatinus. It was the smallest of the three temples. 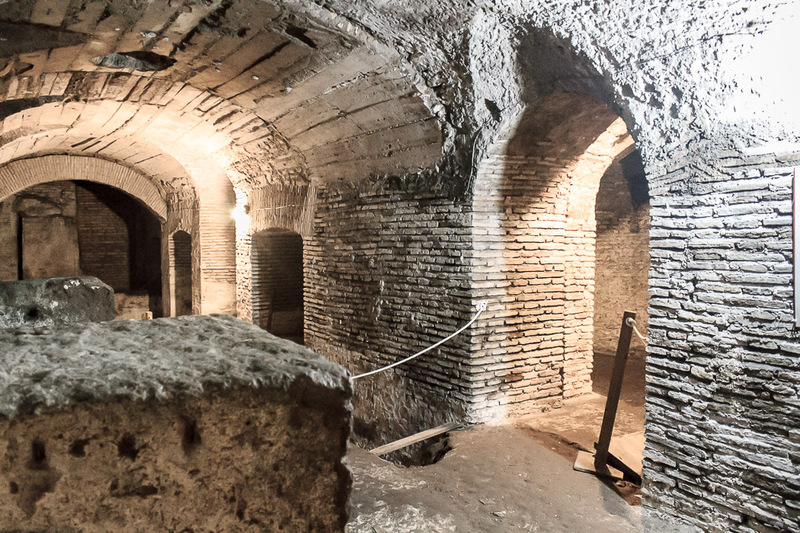 It burned down in 213 BC and again in 31 BC, and was rededicated by Germanicus in 17 AD. 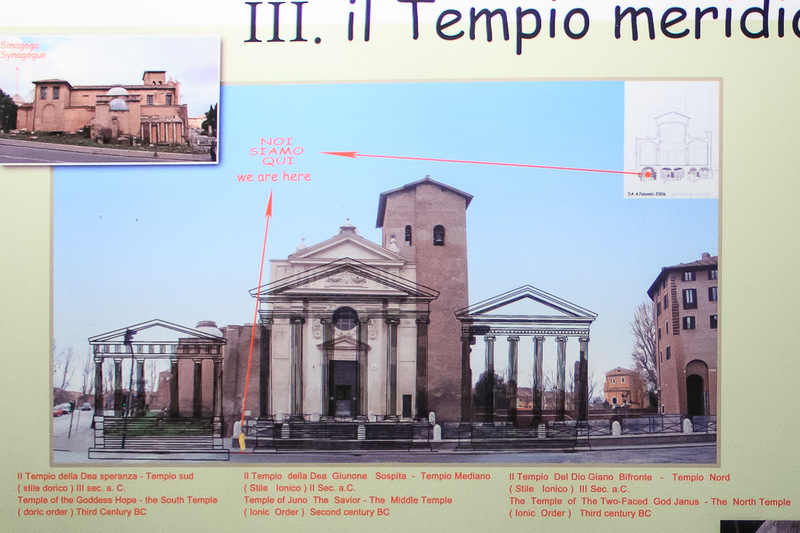 The columns from the right side of that temple are built into the left exterior wall (1st photo below) of San Nicola. 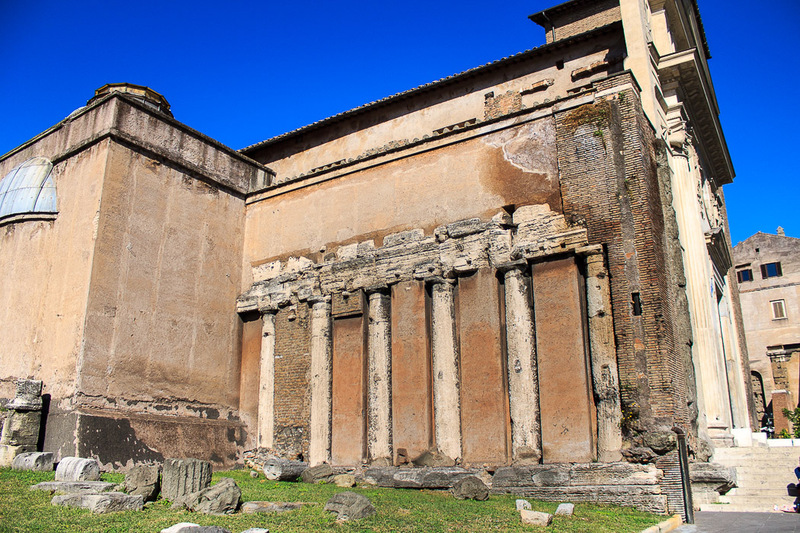 The northern (right-side) temple was dedicated to Janus Bifrons (god of Gates and Passages, closely associated with the Tiber), built in 260 BC by the consul Caius Duilus after the Roman victory in Sicily over the Carthaginians during the first Punic War. 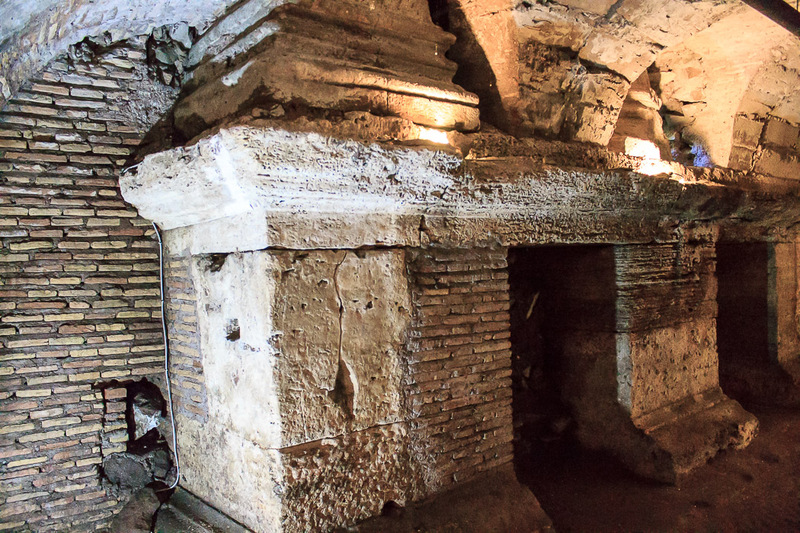 The temple was restored by Augustus and restored again by Tiberius in 17 AD. The columns built into the right exterior wall of the church and the two columns free-standing in the foreground (2nd and 3rd photos below) are from that temple. 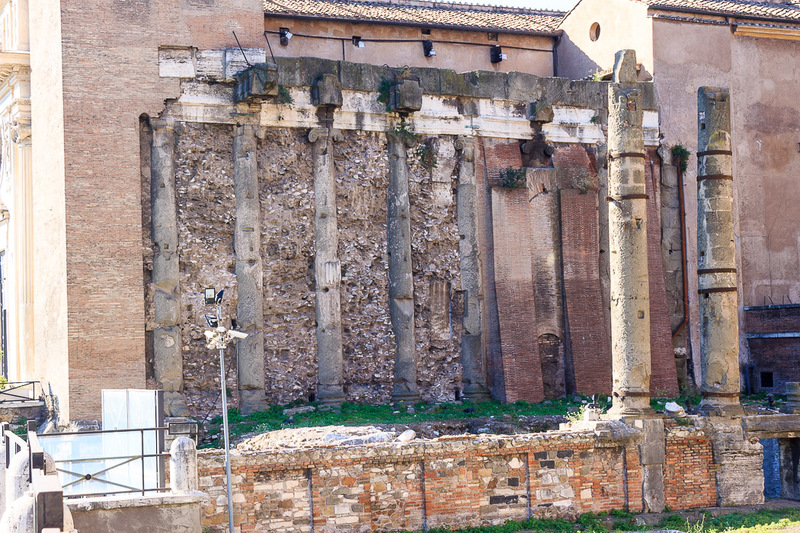 The columns built into these exterior walls were standing before the church; the walls of the church were built around the existing columns. 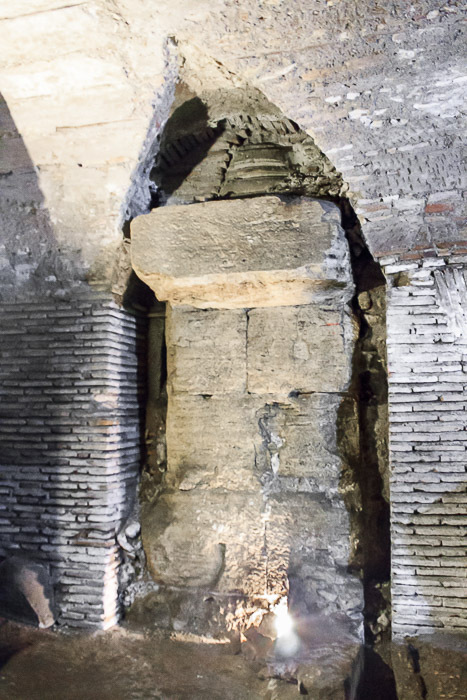 The Arch of Janus, dedicated to the same god of Gates and Passages, is just down the street, a few stops in your future if you're following my To the Forum Boarium and Beyond Walking Tour. The church was founded in the early Middle Ages (perhaps the 7th century) and dedicated to St Nicholas of Myra, the patron saint of sailors and of children, and the remote cause of the phenomenon of Santa Clause. It was reconsecrated in 1128 and remodeled with its ornate facade in 1599. 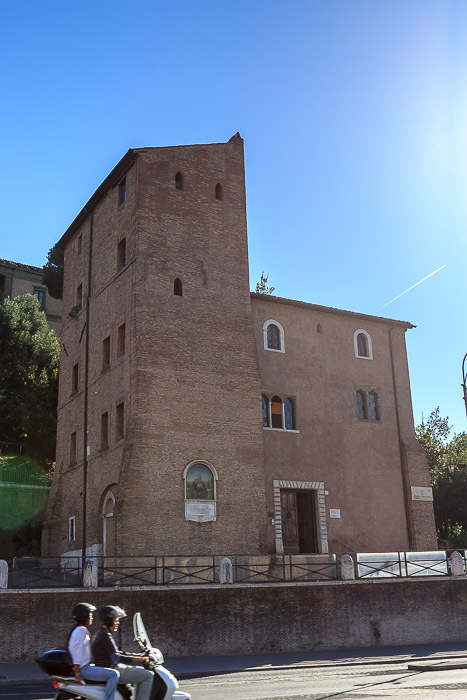 The belltower was originally used for defensive purposes of a fortified family housof the Pierleone family, matching their 11th century mansion across the street (1st photo below), and was annexed to the church when the house was abandoned. 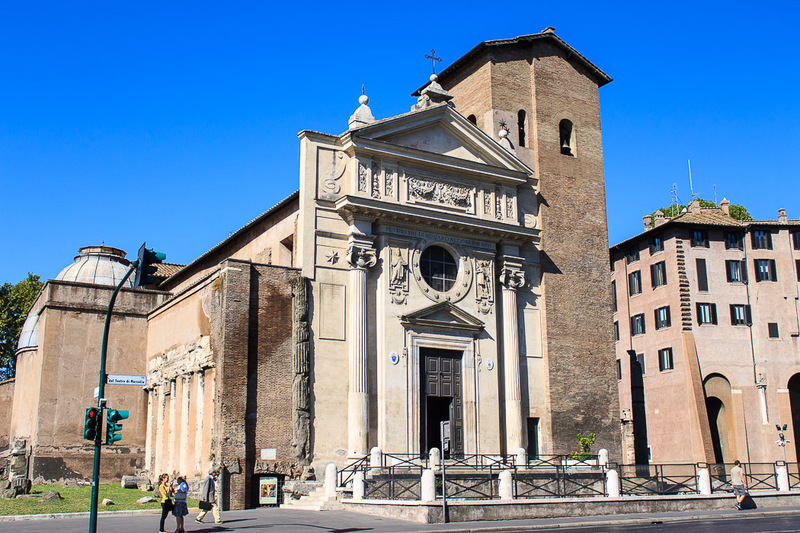 A neighborhood of small houses grew up around the church over the ages but were torn down in the 1930s since Mussolini wanted the church and the Theatre of Marcellus exposed. 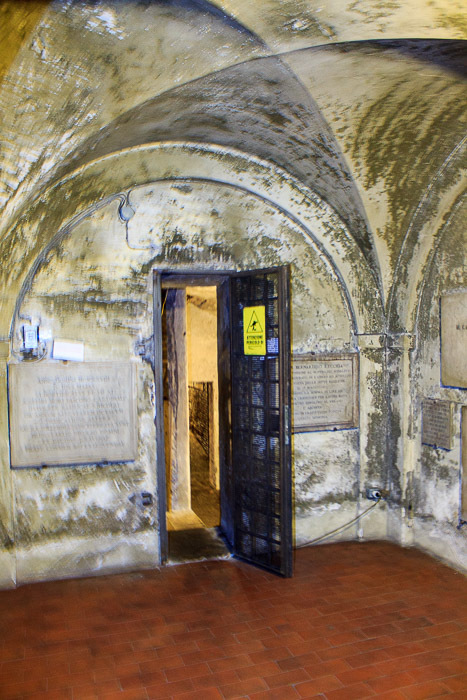 The reference to a prison (in carcere) in the name of the church is probably due to a Byzantine jail which existed in the vicinity but is now long gone. 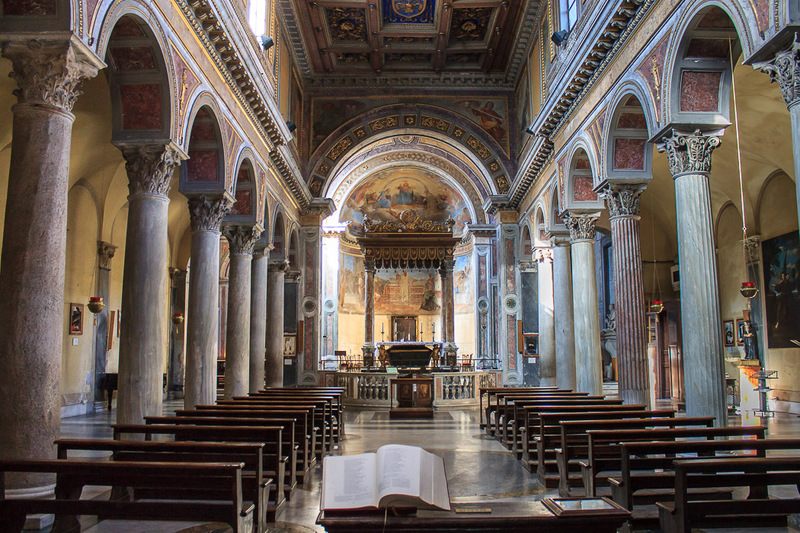 Inside, the church is designed like a Romanesque Basilica (1st photo below). 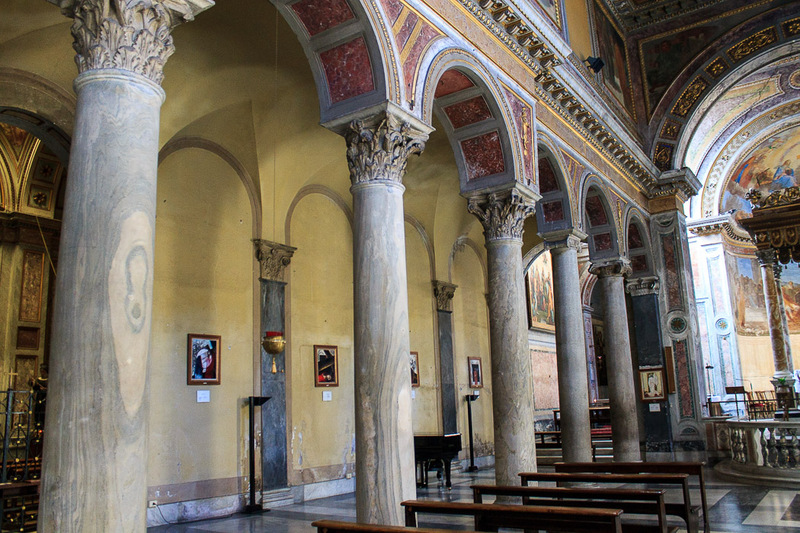 Like in Santa Maria in Aracoeli, the 14 columns in the church are all different from each other and originate from buildings of the Roman era (2nd and 3rd photos below). 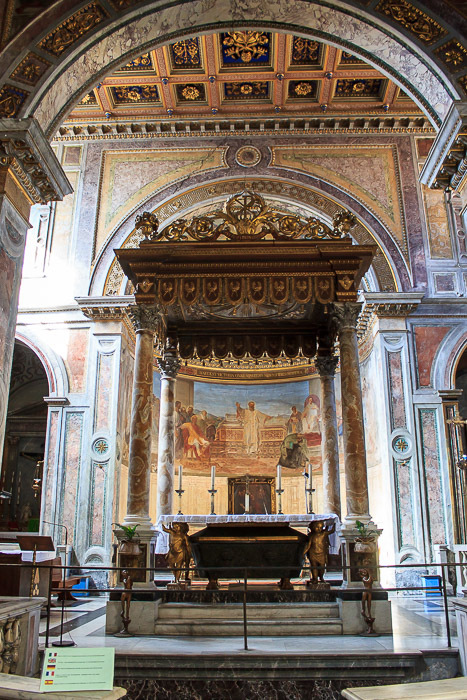 The altar is shown in the 4th photo below. 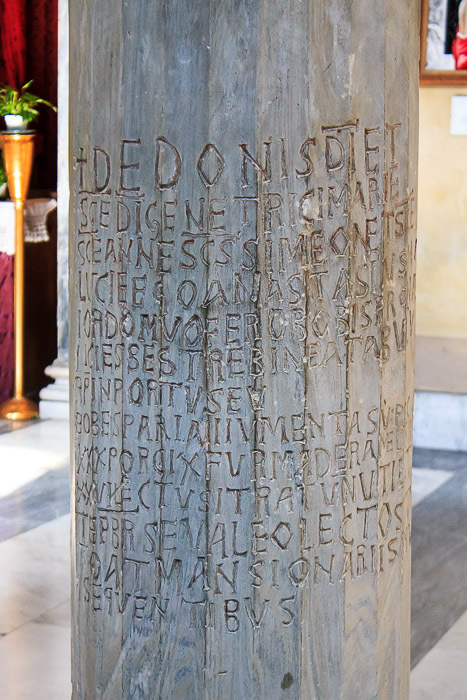 One column in the church (5th photo below) has a 9th-century inscription stating that the author donated to the Church some animals, a vineyard and other things in order to ensure the salvation of his soul. 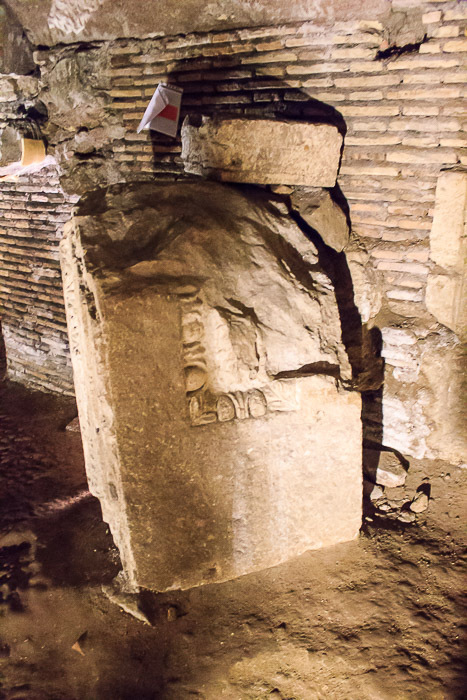 Another ancient column, embedded into an interior wall, with an inscription next to it is shown in the 6th photo below. 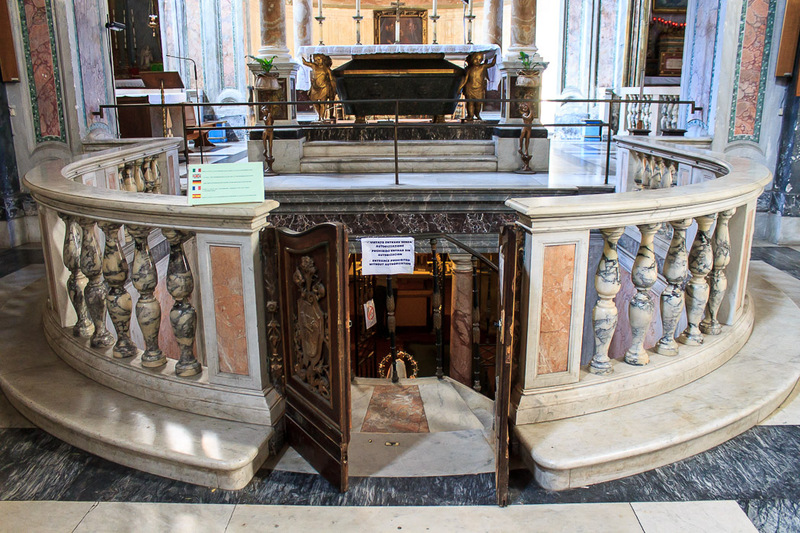 After paying your €2, you can walk down into the confessio (sunken chapel) in front of the altar (1st photo below), look back up into the church if you'd like (2nd photos below) and walk down into the crypt (3rd photo below). Signs lead you through a gated doorway (4th photo below), through a short corridor (5th photo below), and into what was once the ground level of ancient Rome (6th photo below). 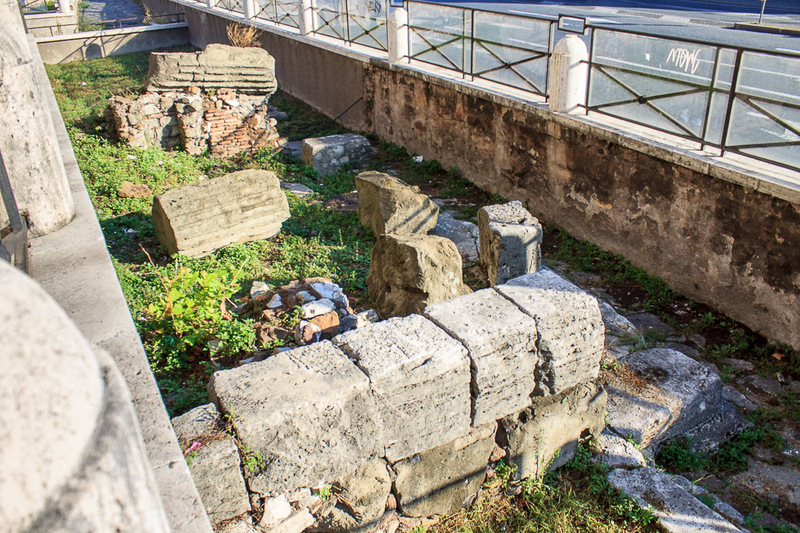 From this point on, you will be standing where Romans once stood in the ancient temples, all built before 194 BC, and you'll be seeing the foundations and podiums of the three temples. 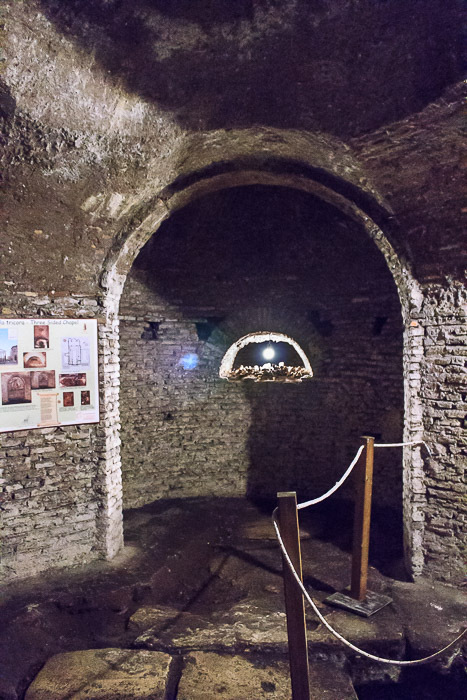 The foyer of the underground of San Nicola in Carcere. The entrance to the underground is through the gate on the left. 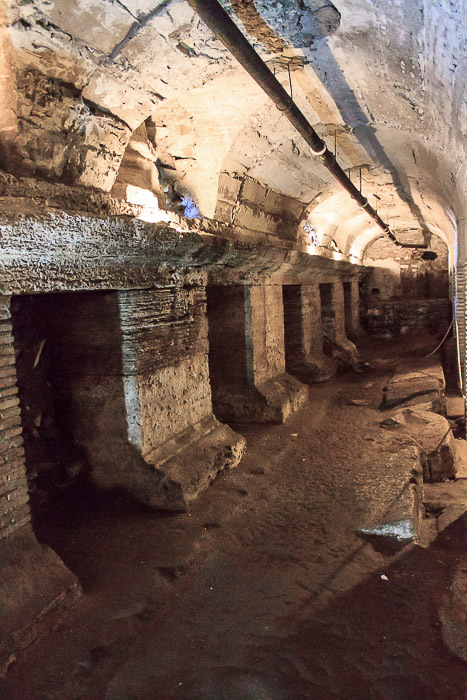 The first room you enter underground (last photo above) was the space between the Temple of Juno Sospita (center temple) and the Temple of Spes (southern temple). 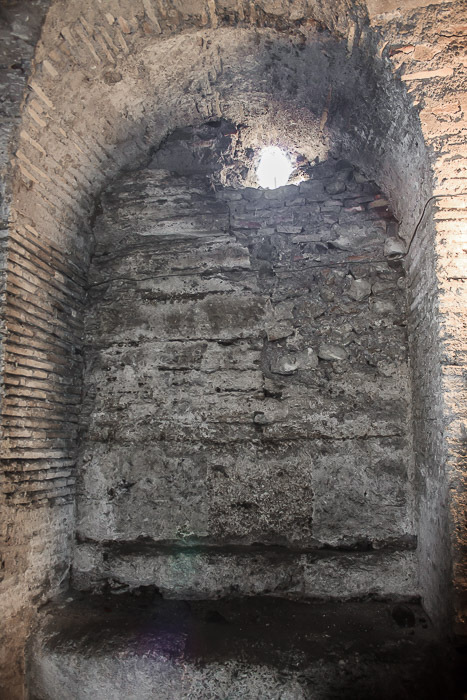 An archway on its right side (1st photo below), half way down, leads into a Byzantine three-sided chapel (2nd photo below) from the 7th century, built on the site of the Temple of Spes. That photo shows one of the three alcoves in the three-sided chapel, this one containing the altar, with a 15th century fresco above it. 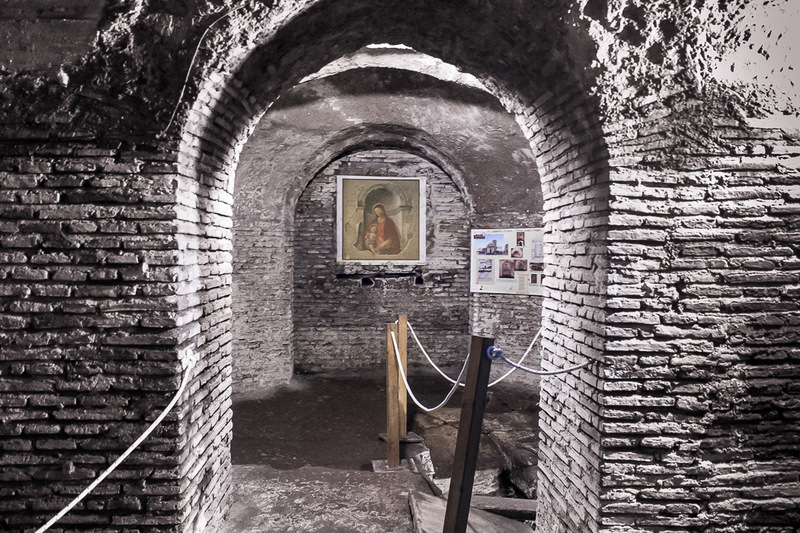 By the way, that photo also shows one of the several posters in the underground area which explain where you are, and point out a few interesting features. 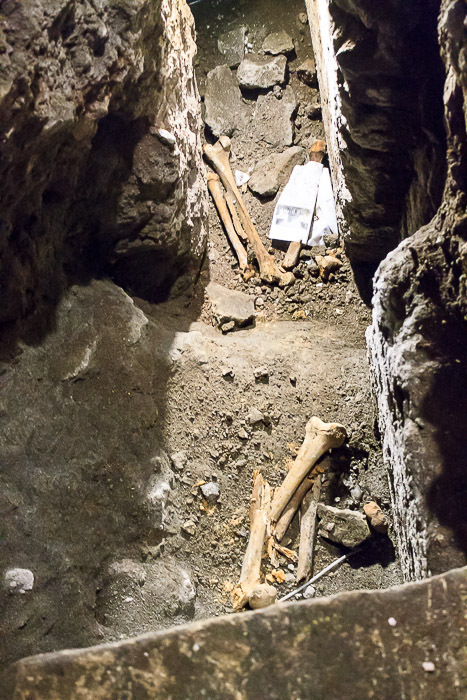 As you enter the three-sided chapel there is a pit in the floor which contains bones from burials under the church (3rd photo below). 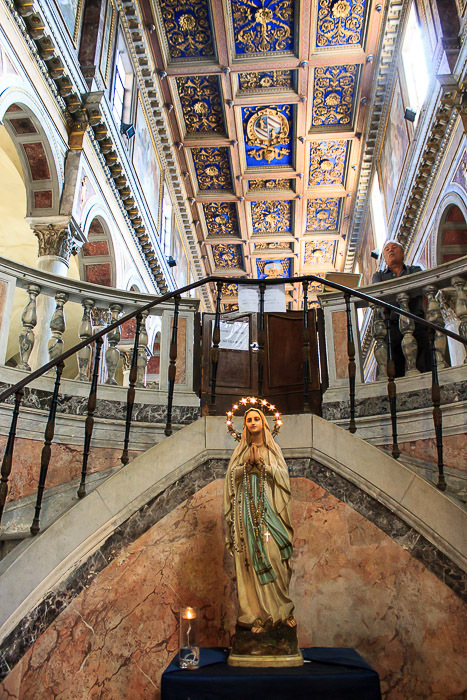 Once you walk all the way into the three-sided chapel, you can look left (4th photo below) and right (5th photo below) into the other two alcoves of the chapel, beside the one straight ahead (2nd photo below). 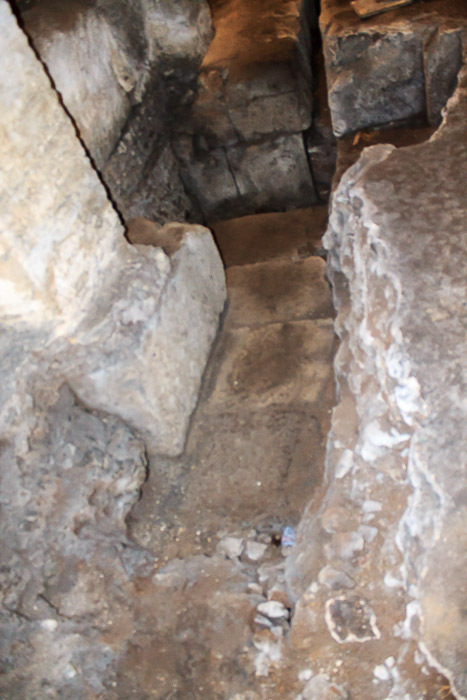 In the alcove to the right is a niche in the wall, containing more bones (6th photo below). Go back out from the three-sided chapel into the room where we started, which was the space between the Temple of Juno Sospita (center temple) and the Temple of Spes (southern temple). 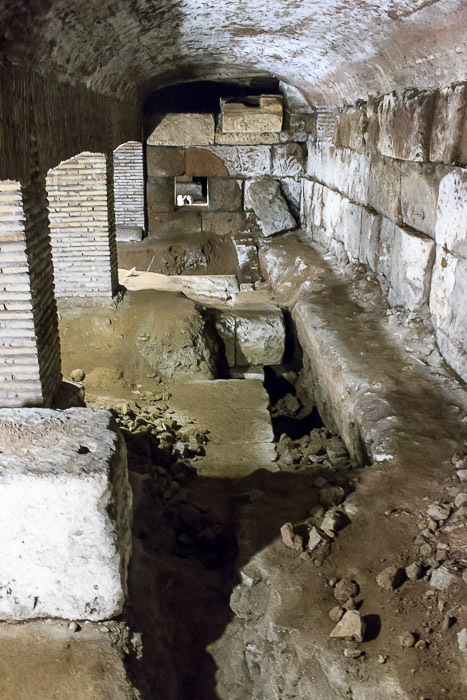 Turn right in that room to go to another roped-off area where the flooring of the Forum Holitorium has been excavated (1st photo below). 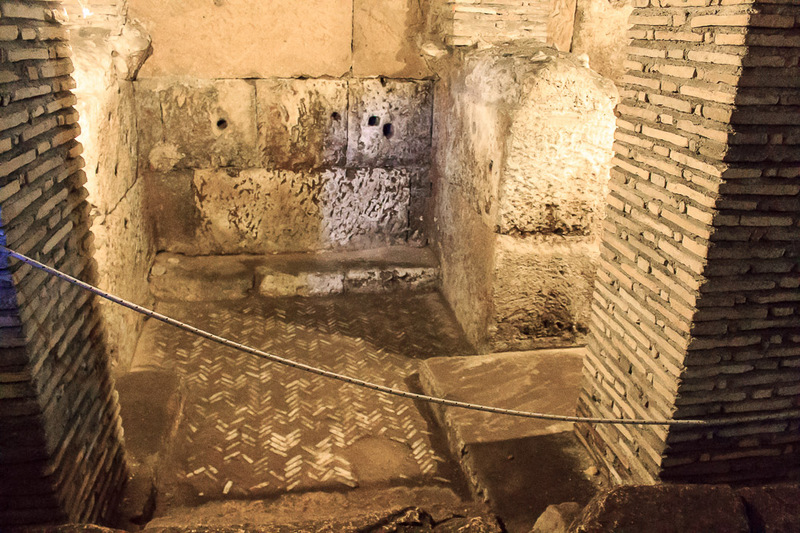 Past the roped-off area, further along that right-side wall, is the podium base and a column of the Temple of Spes (2nd photo below). The column is hard to make out, but it's at the top of the the left half of the alcove. The 3rd photo below is the reverse-angle of the first photo in this room (last photo in the 2nd set above), and shows the view looking back from the far end of this room. 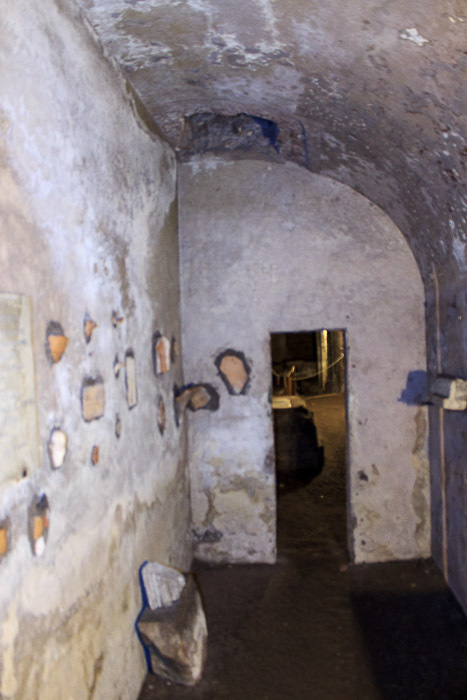 As you walk back across the room, to the end where you entered and where you will exit to go to the next room (see the red arrow pointing to the left? 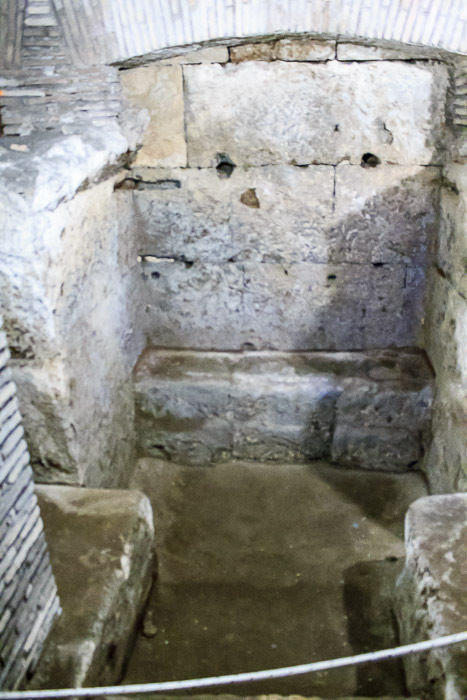 ), notice on the right wall (the opposite wall from where everything's been thus far) is the cella podium (part of the base upon which the central room of the temple rested) of the center temple, the Temple of Juno Sispita (4th photo below). 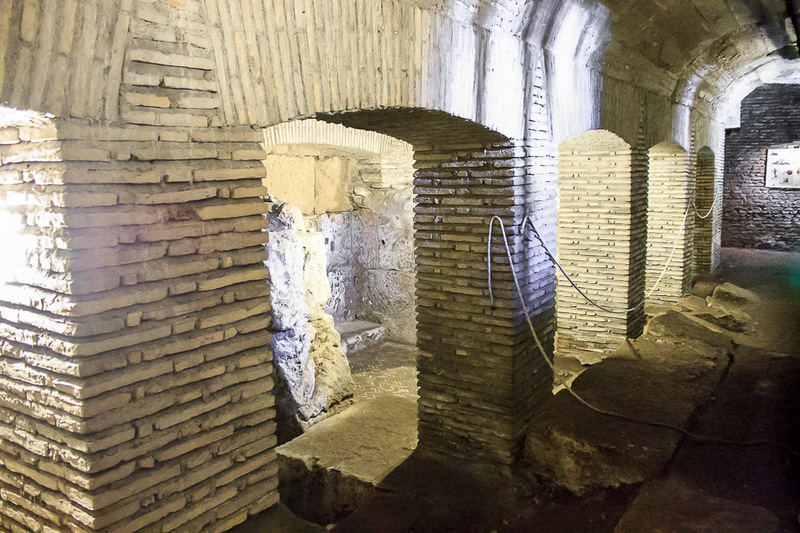 After following the signs and walking through a few corridors, you reach a large area from the Temple of Juno Sospita (center temple). 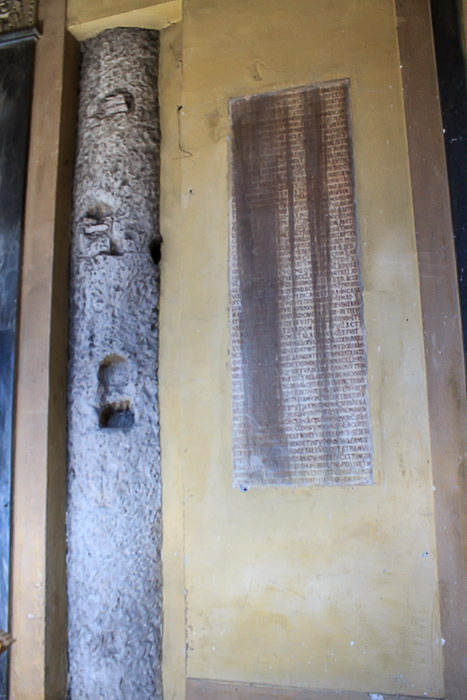 As you enter the room there is a fragment of the architrave from the outside of the temple (1st photo below). 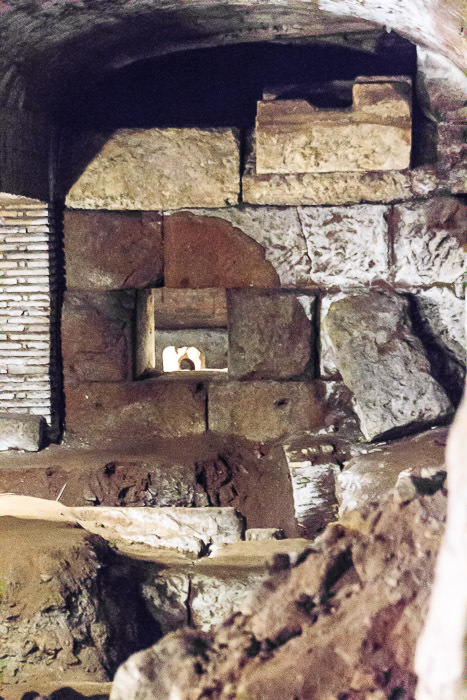 The long narrow room you enter has the stone wall of the inner cella (room) of the temple on your right side (2nd photo below) and the base of a door jamb at the far end (2nd and 3rd photos below). 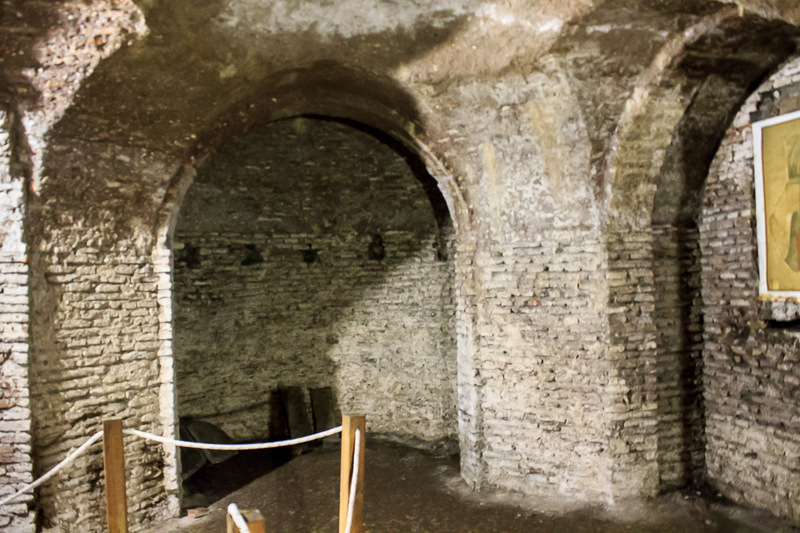 The reverse angle of this room is shown in the 4th photo below, and the remains of an altar under the middle temple are shown in the 5th photo below. 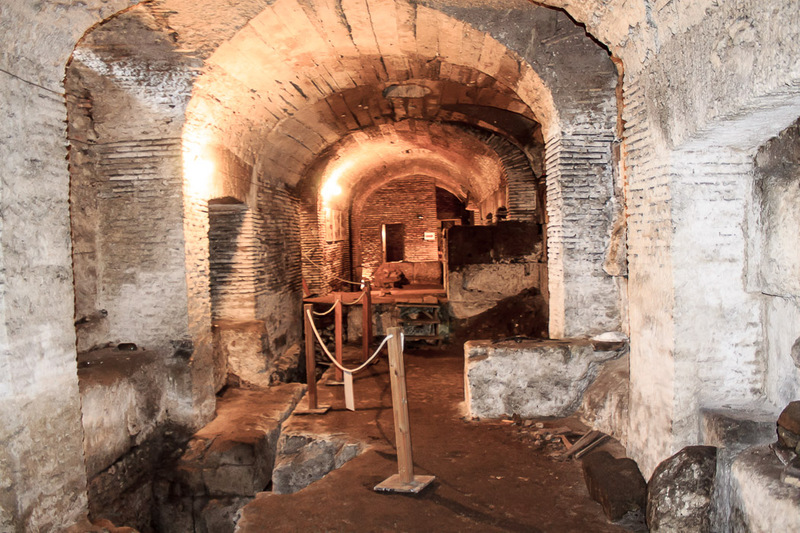 A few more signs and a few more corridors lead you to the last and best room in the underground of San Nicola. This is an alley that ran between the Temple of Janus Bifrons (north temple) and the Temple of Juno Sospita (middle temple). 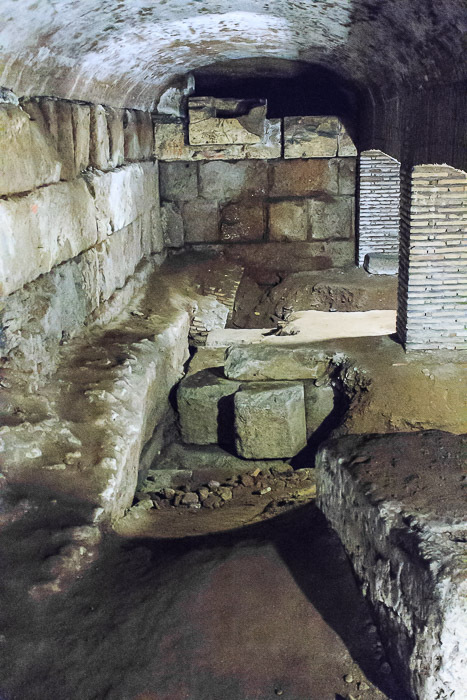 The 1st and 2nd photos below show the left side of this alley, which is basically the podium of the Temple of Janus Bifrons. 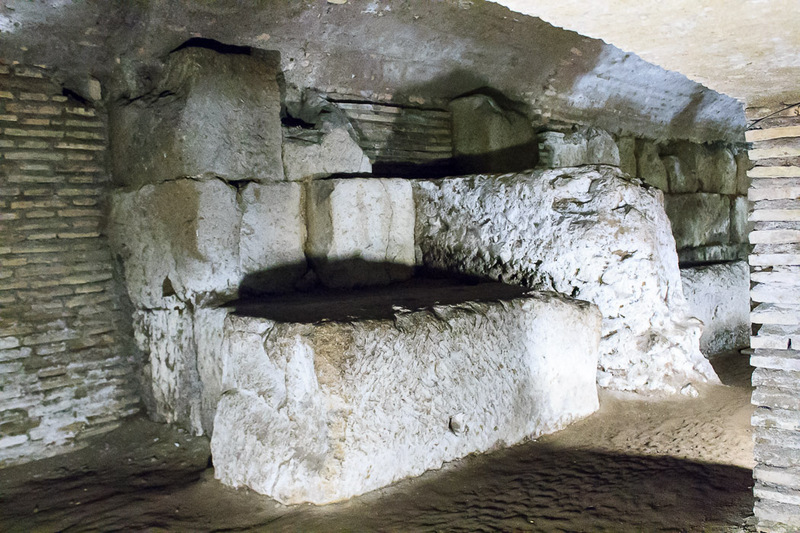 At the top of the foundation pillars on the left side of the alley is the massive stone podium of the temple, and resting on that podium are the bases of the columns of the Temple of Janus Bifrons, one of which is shown in the 3rd photo below. The podium of that temple is also shown in the 4th photo below. The right side of this alley, from the same point of view of the photos above, is shown in the 1st photo below. 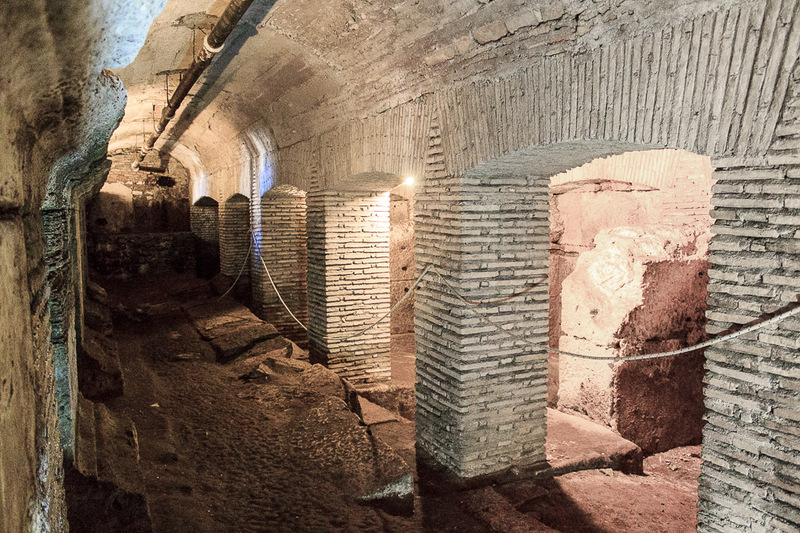 On the right side of the alley are shops (2nd photo below, which is looking back from the far end of the alley) that were on the ground floor of the Temple of Juno Sospitas. One representative shop is shown in the 3rd photo below, and another, with fancy flooring, is in the 4th photo below. These are very small spaces, just 4 or 5 feet square. Those shops might have sold high-value items associated with temple cults, or might have been ancient currency exchange offices, or might have been fruit and vegetable booths, or simply storage rooms, or maybe they were the prison cells referred to by the name of the church (but probably not - this theory is largely discounted); no one really knows and it depends on which source you're reading. 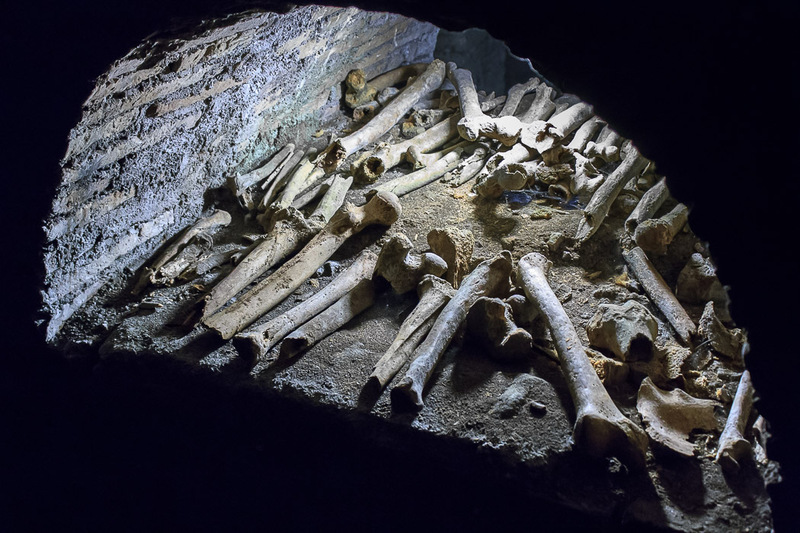 Ground floor in the underground? 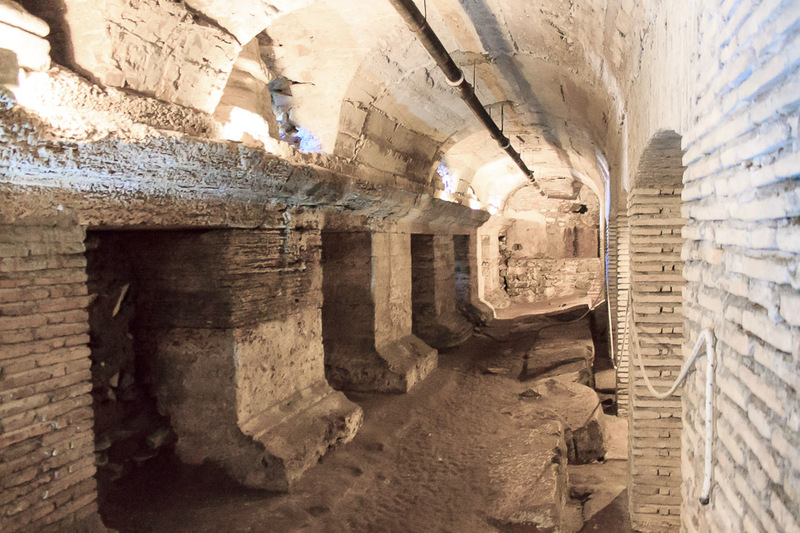 Yes, this is yet another example that shows how much the ground level of Rome has risen over the millenia. Especially this close to the Tiber River which flooded from time to time, the level of the ground has risen enough that what was at ground level back in Republican times is way underground today. 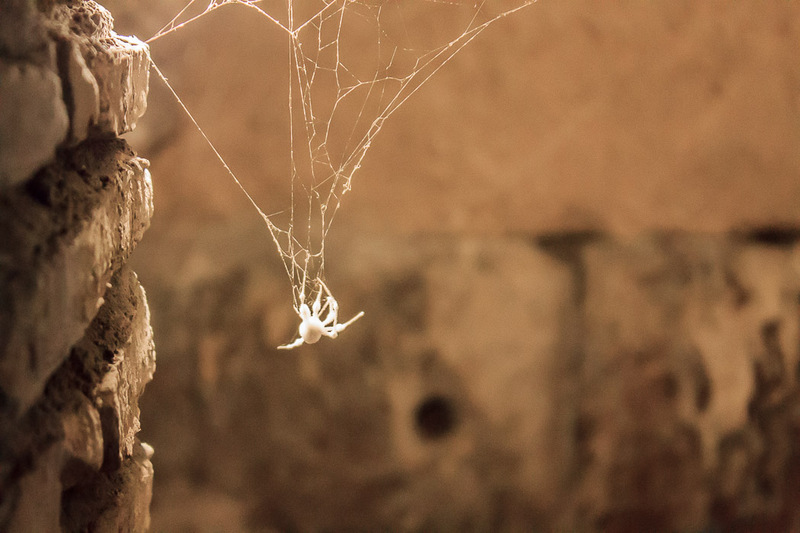 Finally, just for fun, here's the spider that was in one of the cells on the ground floor of the Tenmple of Juno Sospitas during my 2014 visit. 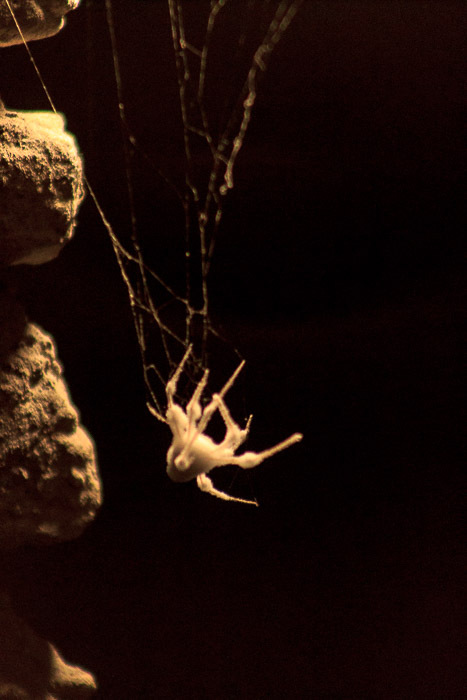 I spent a long time trying to get a decent photo of this guy in the extremely faint light down here. I wonder how long he's been dead? 2000 years?